Archbishop Blase Cupich plans to spend Christmas Day in the community, including a visit to the Cook County Jail. CHICAGO (WLS) -- Archbishop Blase Cupich celebrated his second midnight mass in Chicago at Holy Name Cathedral early Christmas morning. On the holy day for Christians, worshipers filled Holy Name and songs filled the cathedral. Cupich told the gathering at the River North church that there is light in the darkness and to not be afraid, touching on using faith to drive out darkness. "Like the shepherds, this night we are called to believe that there is more to the darkness, that God is at work in the darkness, walking with us," Cupich told worshipers. Christians celebrate Christmas in Bethlehem, the traditional birthplace of Jesus, in December 2015. Cupich did not specifically address issues in the city, but the homily comes after weeks of tension in the city after the shooting death of Laquan McDonald and other cases of alleged police brutality. On Christmas Eve, protesters demonstrated along the Magnificent Mile and, at times, scuffled with shoppers and police. Marchers demanded the resignation of Mayor Rahm Emanuel and reforms in the Chicago Police Department. The protest was mostly peaceful, but two demonstrators were arrested. Another march is planned for New Years Day. "Let us not let the darkness, the uncertainly of the world, leave us undivided," Cupich said in his homily. Also on Christmas Eve, Cupich visited pediatric patients at Lurie Children's Hospital in Chicago. He said he admired the strength and courage of the children and their families, and noted that it encourages him to do more. Archbishop Cupich plans to spend Christmas Day in the community, including a visit with inmates at the Cook County Jail. Pope Francis led midnight mass at Saint Peter's Basilica at the Vatican where thousands celebrating with songs and prayers. Christmas Day mass will also be held at the basilica. Christians flocked to Bethlehem, the traditional birthplace of Jesus. A ceremony was held in manger square. Recent unrest between Palestinians and Israelis forced the cancellation of some of the city's other Christmas observations. 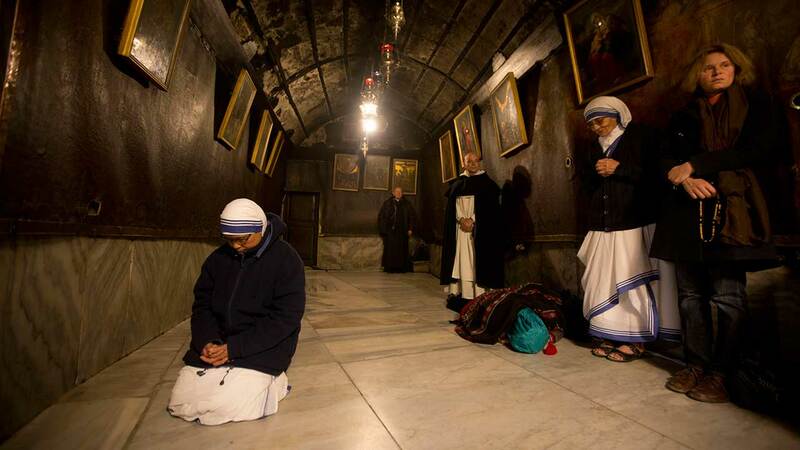 Christians in Syria attended a rare holiday celebration. A group of activists in Damascus delivered gifts to hundreds of children who have lost their parents in the Syrian Civil War. Also, a small Christmas miracle. Holiday lights were shining bright in some areas that are usually prone to power cuts.